The Sage Colleges Library shared this photo the other day and it made us smile. 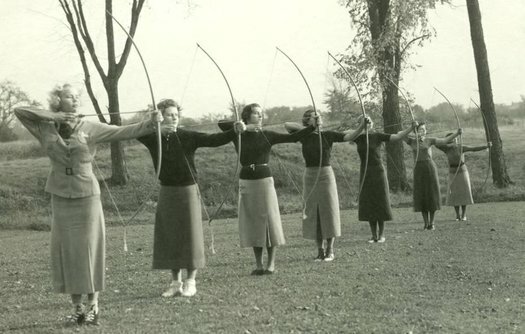 It's from a 1937 archery class at Russell Sage College. The photo is from a collection of Sage archival photos maintained online by the New York Heritage Project. A few more examples: a photo from a circa 1940 auto mechanics class, and working the in the lab during the 1920s. We're a little disappointed our college education didn't include archery. 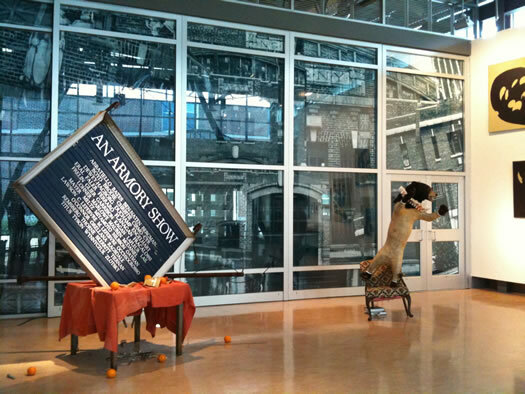 'An Armory Show' is a multi-discipline project, which pays homage to 'The Armory Show' of 1913, held at the 69th Regiment Armory in New York City and presented by the Association of American Painters and Sculptors. The work presented will speak to the dynamic changes that occurred in the art world in general as a result of its occurrence, and to the history of its effect on the artistic life of the Capital Region. A salon, an exhibition within the installation, will include the work of over 30 artists from the region, including that of RPI faculty Shawn Lawson, Larry Kagan, Nathan Meltz, Paul Miyamoto, and Bill Bergman. The salon is set up within space created by a drywall facade that resembles a giant tank (complete with turret). It makes the gallery space feel more intimate, and the many of the works of the in the salon -- including illustrations, video, sculpture, collections of small items, one of Heather Dewey-Hagborg's DNA portraits -- prompt you to look closer. It's like of like hanging out inside someone's imagination. The exhibit just opened this past Friday. It runs through December 15. There's an artists tour with Oatman and Ragsdale October 1 at 5 pm. 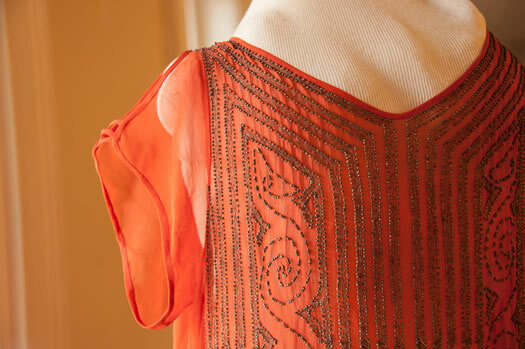 Detail from a flapper dress. new work from Fitzgerald and the atmospheric sound of Victrolas. And maybe it was, if you were a certain kind of person. Maybe less so if you were a woman or a minority. Expo 1920s uses fashion, technology and leisure items from the RCHS collection and joint research by Russell Sage College Women's Studies students and RCHS staff to explore the question, are the 1920s so different from today? The program features an expo-style show that will highlight twelve different historic artifacts, from flapper dresses to home appliances, wool bathing suits to linen duster coats that highlight the themes of sexuality, consumerism, privilege and power. A multi-media presentation including historic photographs and music serves as the audio/visual backdrop for the show. 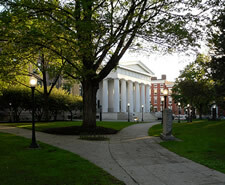 After the expo portion of the event, Dr. Shealeen Meaney, Assistant Professor of English, Director of The Helen M. Upton Center for Women's Studies and Coordinator, American Studies at Russell Sage College, will moderate a Q&A session fostering community dialogue. The program is April 27 at 7 pm in the Bush Memorial Hall at Sage College in Troy. Tickets are $25 and $35 ($10 for students). RCHS has shared photos with us of some of the artifacts from the expo. A few are after the jump. 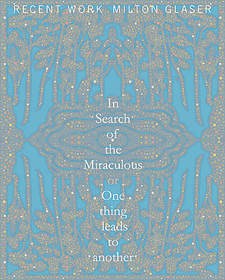 Opening this week at Sage's Opalka Gallery: "Milton Glaser: In Search of the Miraculous: One Thing Leads to Another" -- a collection of recent work by the famous designer. There's a reception for the exhibit this Friday (November 2), from 5-9 pm. Glaser has created many designs you'd probably recognize -- maybe most notably the I (heart) NY logo (which he created pro bono for the state, in the back of a taxi). On November 14, there will be a screening of a documentary about Glaser, To Inform and Delight. The doc's director, Wendy Keys, will also be there. The screening is at 6 pm -- it's $5. 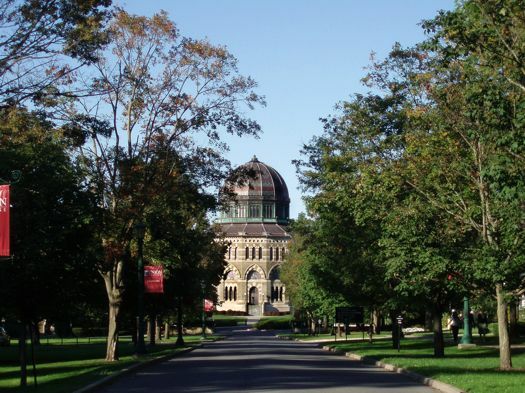 The Opalka Gallery is on the Sage Albany campus, at New Scotland Ave/Woodlawn Ave/S Lake Ave. It's open Monday-Friday 10 am-8 pm, and Sunday noon-4 pm. 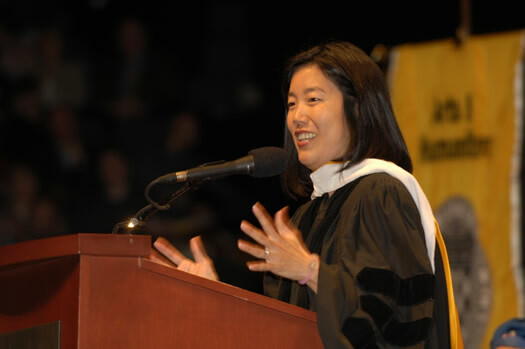 Mark Sullivan sang during his St. Rose commencement speech. Twice. 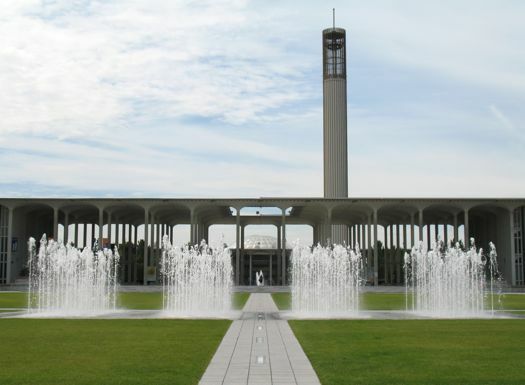 We're just about finished with commencement season here in the Capital Region. Pomp. Circumstance. Advice. A few items from Shea's time at Sage. You know those scenes in movies where a person is approached by an attorney, and the person's all like, "No, not me, I think you have the wrong person..." And then the attorney says, "Your long lost aunt has passed away. And left you a million dollars." It sounds like that's sort of what happened to the Sage Colleges. The school(s) announced today that it was recently surprised by a bequest from Lucile Rosenfeld Shea, who attended Sage in the 1930s. The amount: $9 million -- one of the biggest gifts in school history. 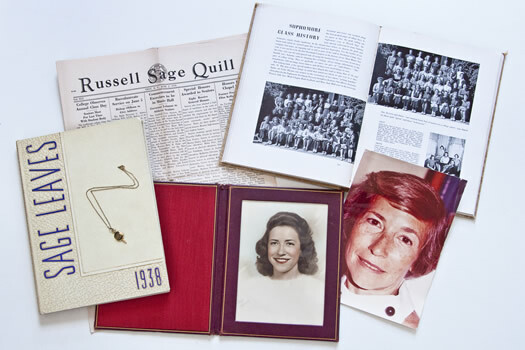 The Sage Colleges were notified recently that Lucile Rosenfeld Shea, who attended Russell Sage in 1937 and 1938, willed Sage a bequest valued at more than $9 million. Shea, who most recently lived in a retirement community in North Carolina, had donated modestly to the college during her lifetime and did not reveal the details of her bequest before her death. 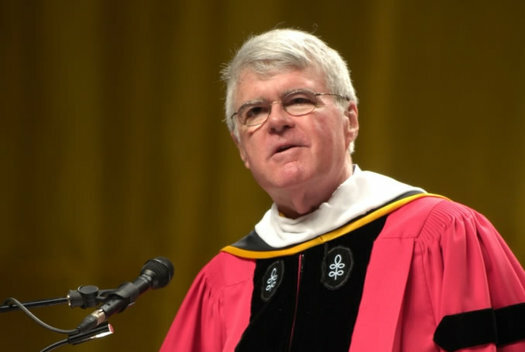 A lifelong lover of books, Shea dedicated the gift to benefit the Troy Campus Library. The designation of the gift could not have been more fortuitous, as the library has been identified as a priority need for capital improvements, in anticipation of a centennial campaign for Sage's 100th anniversary in 2016. This is the second large gift Sage has received recently. In March, Donna Esteves -- the chair of school's board an an alumna -- gave $10 million to the school, the largest gift in its history. A new life for the New Scotland Ave Armory? Waiting for something to do. 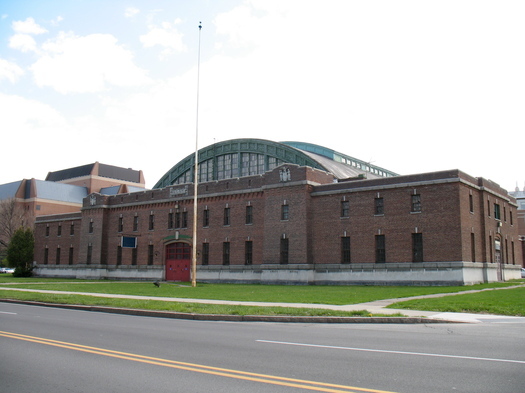 Given its location and understated grandeur, it always seemed like the New Scotland Ave Armory in Albany should be able to find some sort of use. And now maybe it is. The Sage Colleges are in the process of buying the building from the bankrupt research institute that currently owns it, the Biz Review reports. It makes sense -- Sage's Albany campus is literally right next to the building. The Sage Colleges announced today that an alumna -- Donna Esteves '70 -- is giving the school $10 million. It's the biggest gift in school history -- bigger even than the gift from Margaret Olivia Slocum Sage that helped found the college. The school says it will use the money to renovations projects, as well as build the college's endowment. And, as usually when someone donates a bunch of money to a school, Sage is naming its school of education after Esteves. So how did Esteves end up in a position to drop this sort of coin on her alma mater? Gahring, a 2004 Russell Sage College grad, told the Troy Record earlier this year that she heard about the show via a former Sage classmate in NYC, and got cast after an interview. Here's her Facebook page -- she lists Wynantskill as her home. And here's her Twitter stream. Gahring's talk starts at 7 pm in the Schacht Fine Arts Center on the Sage Troy campus. Tickets for the general public are $10, and will be available at the door. The Paper Battery Company says it's getting the money to build a pilot production line for its "fully printed energy-storage device that is as thin as a piece of paper." 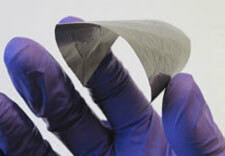 Yep, the company is developing batteries that can be printed onto a paper-like surface. 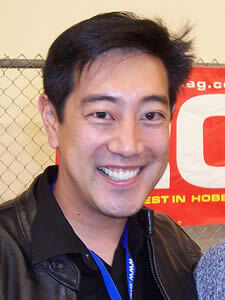 Grant Imahara -- from the show Mythbusters -- will be doing a Q&A at the Sage College campus in Albany this Thursday night. Imahara is a radio control specialist whose worked on animatronics for a bunch of big action movies. He's also operated R2-D2 from Star Wars -- and programmed the Energizer Bunny (still going, we hear). The talk starts at 8 pm. It's $7 for the general public, $5 for college students. 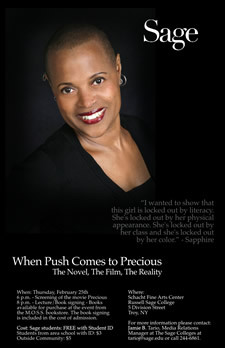 Sapphire -- the author of Push, the novel from which the film Precious (trailer) was adapted, will be giving a talk at the Sage campus in Troy next Thursday (February 25). Precious opened to widespread acclaim last year (it's been nominated for six Oscars). But Push created its own stir -- because of its subject matter, voice and advance -- when it was first published in 1996. The author says that she encountered girls like Precious while teaching -- overweight girls who didn't fit into the confines of our society's beauty paradigm, girls who were essentially "locked out" of the broader culture. "I wanted to show that this girl is locked out through literacy. She's locked out by her physical appearance. She's locked out by her class, and she's locked out by her color," says Sapphire. "I encountered this. I had a student who told me that she had had children by her father." The talk starts at 8 pm in Schacht Fine Arts Center on the Troy Sage campus -- there's a screening of Precious at 6 pm (the center is at 1st and Division). Tickets are $5 at the door ($3 for students, free for Sage students). Sapphire recently spoke to a big crowd at the University of Michigan. We've heard from Sage that they've already changed the talk to a larger venue because of expected attendance. The Sage College of Albany welcomes Max Brooks, novelist, humorist, renowned Zombie preparedness expert and authority on the truth and myths surrounding the undead. The evening will include a reading from new materials, a chance for audience members to ask questions, followed by a book signing. Brooks is the best-selling author of The Zombie Survival Guide and World War Z: An Oral History of the Zombie War. His books outline ways to not only escape a Zombie attack, but shares techniques that allow the reader to defensively prepare for whats to come. 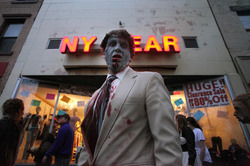 Brooks, who's the son of Mel Brooks, has a new book: The Zombie Survival Guide: Recorded Attacks. The talk starts at 9 pm in the Kahl Campus Center Gym at the Albany campus on New Scotland Ave. It's $5. The no-shake graduation is spreading. First, it was Sage -- and now RPI has succumbed. In light of the continued national presence of the H1N1 influenza virus, we will adopt a slightly modified process as we distribute diplomas at the Rensselaer Commencement ceremony on May 16. In keeping with our tradition, graduates will be invited to the stage to receive their diplomas and be recognized for their achievements, but we will not engage in the customary handshakes that typically accompany the presentation of the diploma. While recent reports on the status of the virus from the Centers for Disease Control are encouraging, we believe that the circumstances warrant an abundance of caution to protect the health of all who participate in the ceremony. The message goes on to urge people who are feeling ill to not attend the ceremony. 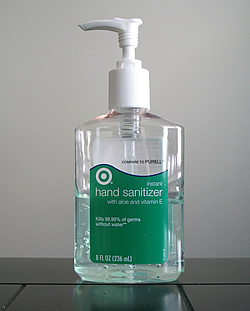 Three schools in NYC were closed this week after another flare up of the emerging H1N1 flu. 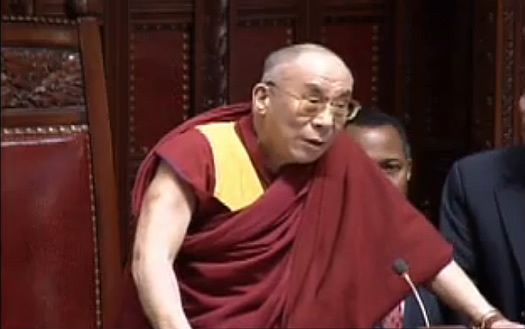 The Dalai Lama speaking in the New York Senate.